Tomorrow, François Hollande will be sworn in as president of France. After the ceremony at the Elysée, he flies straight to Berlin to meet German Chancellor Angela Merkel. He promised the end of austerity, which doesn’t mean he will conduct a wasteful life at the Elysée. On the contrary. Mister Normal ends Sarkozy’s life in the lap of luxury. What counts are symbols. Symbols are what remain at the end. Do you remember the first days of Nicolas Sarkozy’s term? The French do. Definitely. They’ll never forgive him the ostentatious flaunting of power and money: the party at the Fouquet’s, with a guest list that looked like the Who’s Who of the beautiful, the rich, the famous; the days on the yacht of Vincent Bolloré, a rich industrialist and close friend; finally the spectacular entering of the Elysée Palace with Cecilia Sarkozy wearing a golden Prada dress – who had already left the president, but just gritted her teeth and bore it. Hollande will put an end to this era. The images that will remain are aerial views of Tulle, the small town in Corrèze, the capital of the accordion, his political home town, where he celebrated the first moments of his victory; the accordion players on the stage that even the voters of right wing Marine Le Pen must have appreciated; finally the long, long ride to the airport that showed everybody clearly: Mister Normal comes from the deep, deep backwaters. Sarkozy had changed politics into a kind of soap opera. Back then, the editorialists spoke of the “peoplisation of politics”. Hollande wants to put an end to it. But will he be able to? Few things are more certain. The night of his election, France 2, the public broadcast, showed his son Thomas congratulating his father. His iPhone showed “Papa” and Thomas was only purring “oui, oui, oui” giving the political comedians best material. Meanwhile Hollande’s ex-wife Ségolene Royal was shown, sitting in the studio, brightly smiling. About what? The victory of the Socialists? 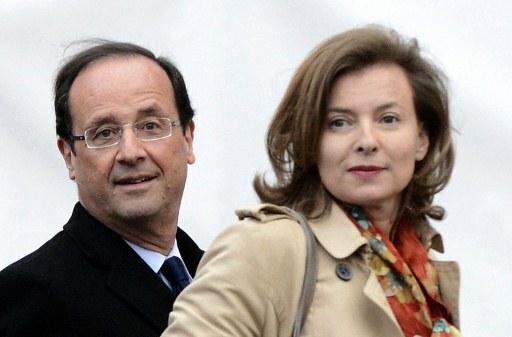 Or the fact that Hollande is finally making him Thomas into “a son of a president”, the thing that she failed to do? And then look at Valérie Trierweiler, his partner in life. The journalist had portrayed Hollande a couple of years ago in “Paris Match”. The headline of the article was kind of farsighted: “L’homme normal”, a normal man. It’s not the first time in France that a journalist has dated a politician – or married him. But it’s the first time that a journalist becomes First Lady and wants to continue her job. As she explained to the magazine “Elle” in her very first interview after the election: she is a mother of three teenage boys and does need to earn some money. She absolutely wants to keeper her financial independence.